Unbelievable, so much time is over since my last post... and much more time since my last release. 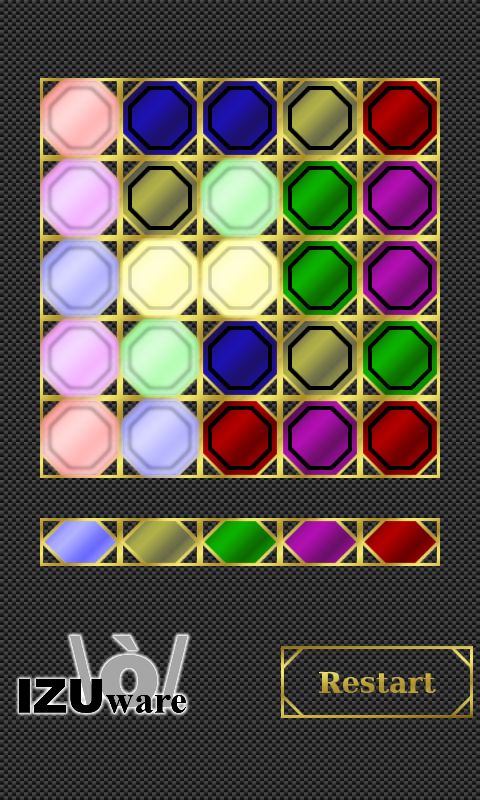 I'm still working on a game, it's not that huge, but I don't find much time for coding and doing the graphics. 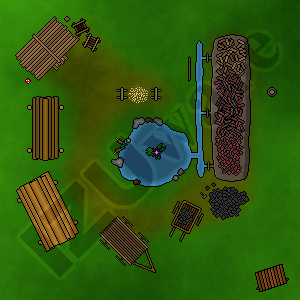 Here is a little example picture I was doing. BTW: I start a new contest on facebook. The normal one, like and share to get the chance of winning something. I hope to get some more fans for my facebook page. I would be happy if you would join it. That's it, this year is nearly over, only a few days left. This was an interesting year for me, the best game, I've released this year was Wheel of Fate. The game I worked most on was The Quest: 50 Dungeons. I'm very proud on these apps, and I hope to have next year more time again to create more apps. I've just released an update to my app "Glücksrad". It now supports english language, so a lot more people out there should be able to play it. The Quest is difficult to describe. It's a little bit of Adventure, a little bit of RPG, a little bit of Reflexgame and a little bit of a barcodescanner. It's a soup where from everything is a little inside... one moment... barcodescanner?! Yes, but one more sentence. The Quest ist schwer einzuordnen. Ein bisschen Adventure, ein bisschen RPG, ein bisschen Reflexspiel und ein Barcodescanner. Irgendwie ist von jedem etwas dabei... Moment... Barcodescanner?! Ja, aber dazu gleich mehr. Dein Ziel ist es 50 Dungeons mit Gegnern zu überstehen. Diese haben jeweils 4 Angriffe, diese reichen von normalen Attacken über Vergiftung bis hin zur Lähmung. Du kannst im Gegensatz dazu 8 Aktionen ins Feld führen, doch startest du nur mit 5 einfachen, nicht sehr schlagkräftigen Aktionen. Und hier kommt der Barcodescanner ins Spiel: Scanne mit der Handykamera Barcodes die du überall in deiner Umgebung finden kannst und verwandle sie in Aktionen. Sammle auf diese Weise schlagkräftige Aktionen und besiege mit Ihnen deine Feinde. Wo sonst kann eine Packung Mehl zu einem Giftangriff werden? Probiere es einfach selbst aus und lass dich überraschen welche Aktionen sich in welchen Gegenständen um dich herum befinden. Neue Wörter sind ebenfalls enthalten und in der nächsten Zeit sollen noch mehr dazukommen. Ich hoffe demnächst die englische Version veröffentlichen zu können und natürlich auch, dass euch das Spiel weiterhin gefällt und ihr Spaß damit habt! 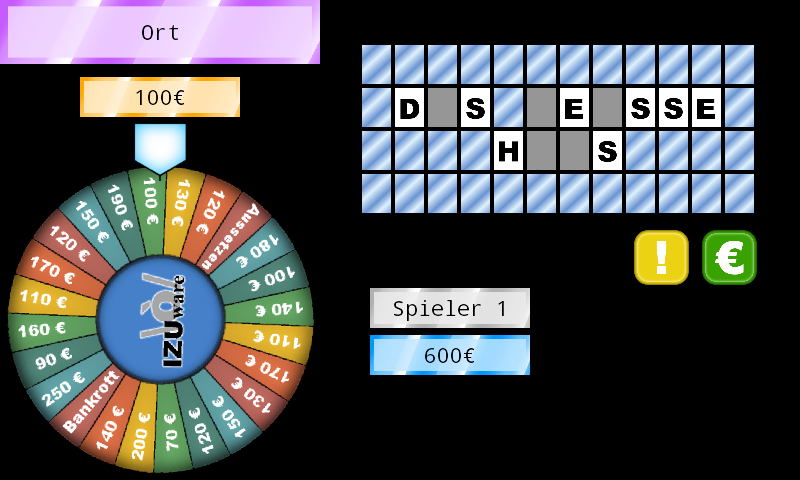 dieser Eintrag wird ein deutscher, denn das Spiel welches ich soeben veröffentlicht habe, ist auf deutsch und hört auf den Namen Glücksrad. Der Begriff bzw die Spielshow dahinter sollte den meisten ein Begriff sein. Das Spiel basiert auf der Spielshow, es gilt einen Geldwert zu erdrehen und richtige Buchstaben auf der Wand zu erraten um dann das Wort zu lösen und zu gewinnen. 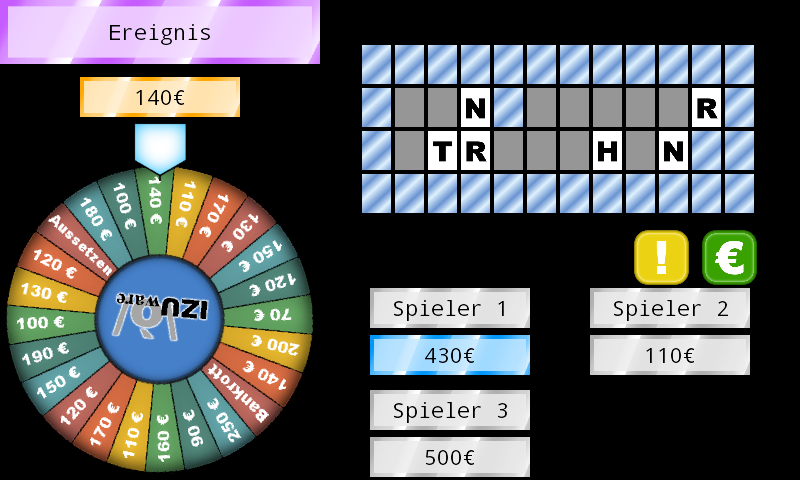 Das Spiel ist kostenlos (die Version ist in den Optionen etwas eingeschränkt) und in Google Play auffindbar. Release, the last for a long time?! 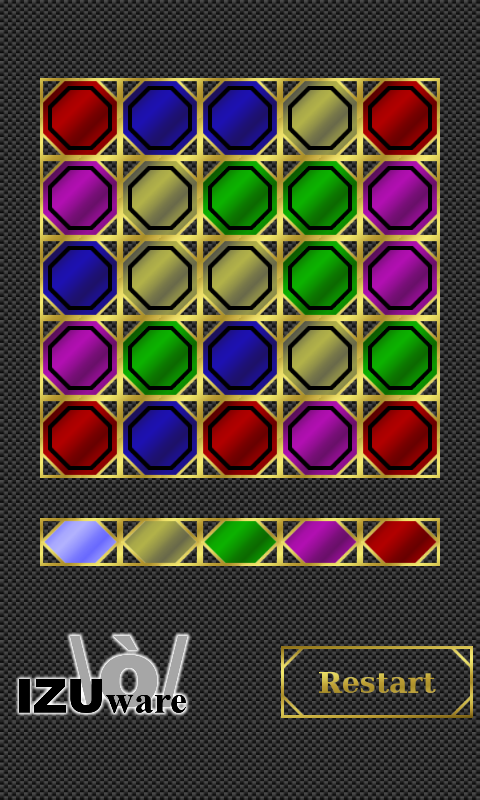 today I released Hexa-Decrease, a little puzzle game. It's quite simple, you've got a lot of hexagon fields with numbers on it. Tap on one and the number on the tapped field and the numbers on all connected fields decrease by one. The difficult thing is, if theres a zero on the tapped field or on a field connected to the tapped field, it will not work. I'm happy to release a new game, called "Stick Runner". Although it's more a test than a game. I was playing with hardware accelerated graphics and for testing and learning I've build a little jump&run game with a stickman. 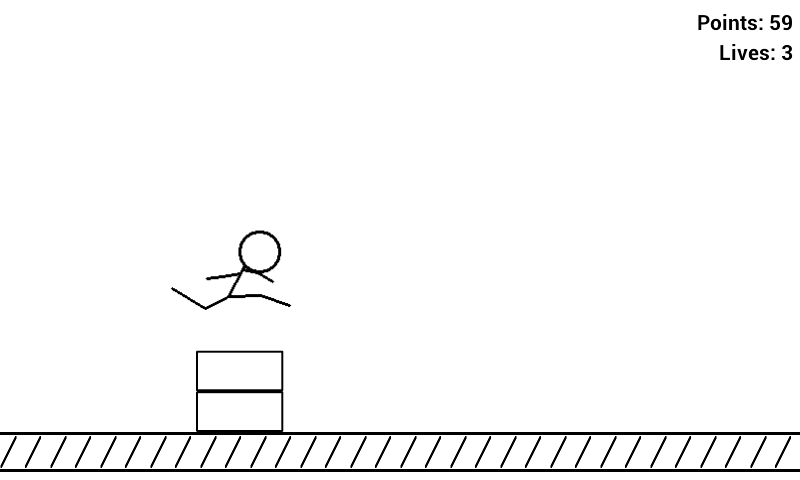 It's quite simple, the stickman runs on it's own, the players task is to avoid the obstacles by sliding or jumping. 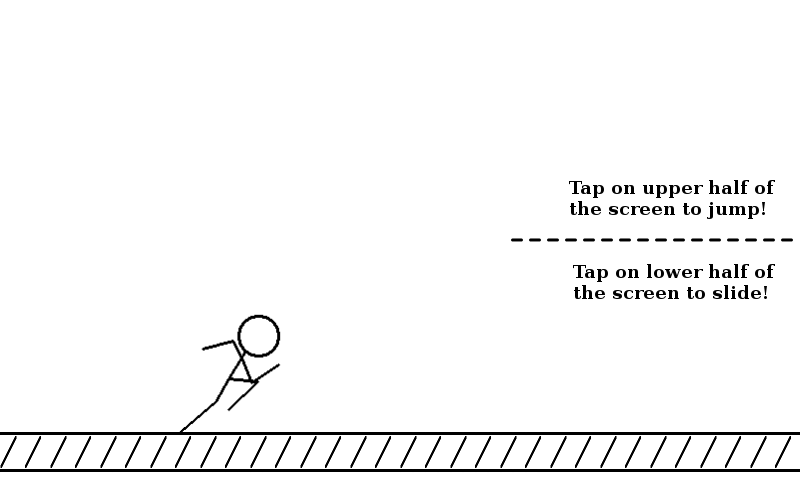 To jump the player have to tap on the upper half of the screen, to slide on the lower half. If you want to test it, please report if you've got issues or problems with it, so I can find the problem to fix it. There are thousands of new apps every day released in Google Play. And I'm doing my best to raise this number. So today I release a new game called Color Jumper. 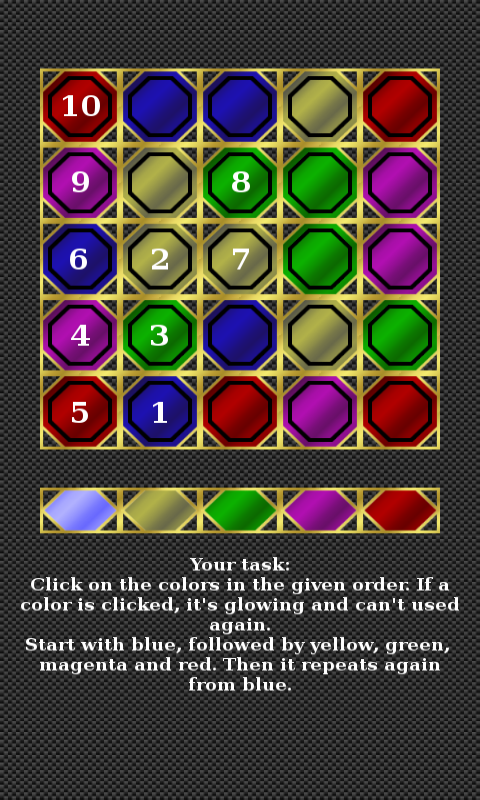 Click on the colors in the given order. If a color is clicked, it's glowing and can't used again. Start with blue, followed by yellow, green, magenta and red. Then it starts again with blue. away from the last color. That means you can jump over another field (for example step 1 to 2, 5 to 6 or 8 to 9), or you have to use the colored field next to the last color. If every field is glowing you've finished the level.